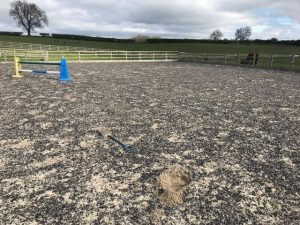 Recently completed refurbishment on a 20m x 60m outdoor arena. 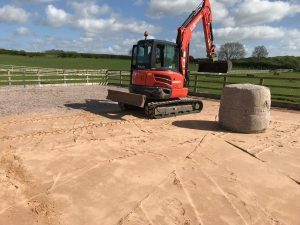 The arena was tired and feeling old, after visiting the site the team decided the most economical and logical way to fix the problem was to incorporate 100 tonnes of new multi washed silica sand, and install 12 bales of stabilising fibre . 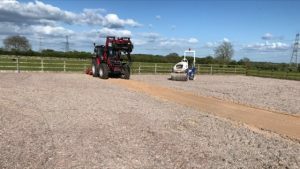 The arena still had a usable surface which was used for the base of the bottom layer of the arena, this will have been levelled prior to the new sand being added. 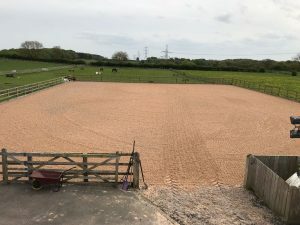 The before and after shots are super as they show what a real difference, and the tired, old arena is now new, full of energy and immediately ready for use.